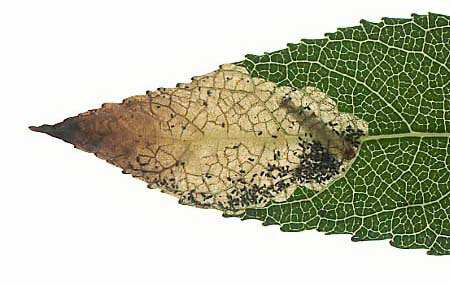 Obviously, the position of the mine in the leaf blade is primarily determined by the oviposition behaviour of the female insect. The oviposiiton site is quite constant in many cases. Often it is the leaf margin, or the egg is placed immediately next to the midrib. Less often the oviposition site is in a vein axil or just someplace on the blade. In Nepticulidae it often (but not always!) is a reliable diagnostic character wether the egg is placed on the upper or the lower surface of the leaf. A number of sawfly species oviposit exactly on the leaf margin. Among them are species that are quite stereotyped. 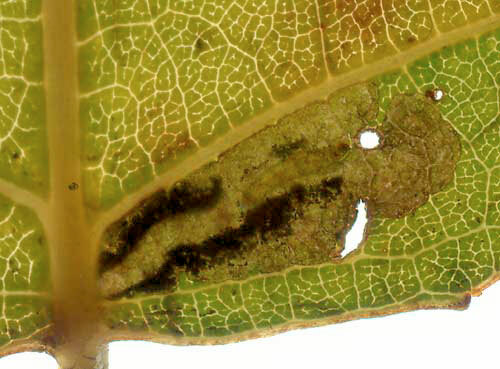 Heterarthrus nemoratus places its egg on the leaf margin, about halfway the leaf. 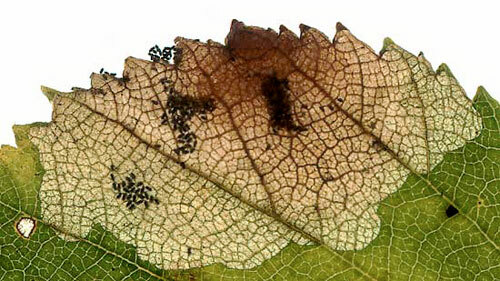 In the species the oldest parts of the mine turn wine red, making it easy to reconstruct the development of the mine..
Trachys minutus is quite catholic in its hostplant selection, but oviposition invariably is on top of something acute: the tip of a leaf, or of a leaf lobe, or of a leaf margin tooth. The first part of the mine may also be hidden within the petiole or the midrib; the larva in that stage lives a borer, rather than as a miner. At a given moment the larva starts making excursions into the leaf blade. Generally during feeding pauzes of when danger threatens the larva retreats into the safety of the initial corridor. Several Ophiomyia-species lave als larvae in the hollow midrib of Liguleae (‘yellow composites’). From there they make broad, lobe-like corridors into the leaf.